The peace of God is far richer and more satisfying than anything we can imagine.nnLet us open a new page of life by first, opening our hearts to the perfect peace the Lord has given to us. When something requires no more work, we say, it is complete. A state of completeness is when nothing is lacking and all the necessary parts are accounted for. I guess the question is can we ever attain this position on this side of eternity? The answer is yes. 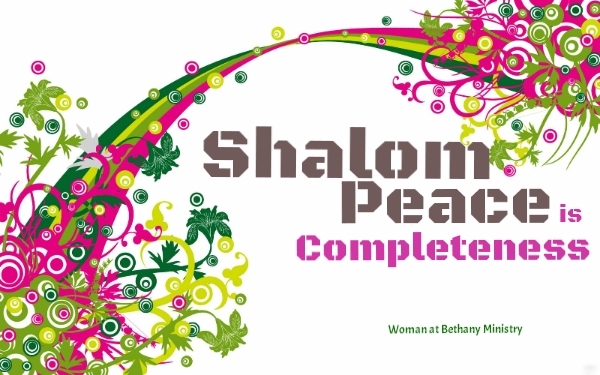 Shalom is the sum total of all the blessings God can bestow on us - healing, prosperity, soundness, well-being, good relationships and perfection. Its no wonder why Satan tries to steal God's peace away from us.nnWe all seek peace in every area of life. The word of God reveals that the peace we seek has been given; our problem is not locating God's peace but receiving and retaining His peace. The Lord has caused His peace to flow like a river and it is up to us to jump in, and stay in. Many things make us loose our peace; disappointments, deceit, impatient, pride and arrogance, to mention a few. The all surpassing God given nature of man enables each of us to exercise sovereignty over our mind, body and soul. We have the right to uphold a thing and we can reject or accept different circumstances that comes our way. This power has been given to each of us and its in our hands to exercise now.nnOur goal is peace, completeness, wholeness in our spirit, soul and body. Whatever is conceived in the spirit permeates the soul, and the body eventually dances to the music of the soul. In pursuit of completeness, we must covet spiritual discipline; this will yield dividends like peace and strength as we face challenges everyday. Over the centuries Christians have practiced and still practice some disciplines such as prayers, fasting, Bible study, worship, silence, solitude, confession, scripture memorisation, service and simplicity. All of these disciplines aim to help us grow in the likeness of Jesus.nnTake time out with God, covet the habit of putting God first in all you do. Let us not relent in imitating Jesus and His completeness in dealing with opposition (Matthew 22:15), love (John 15:9), persecution (Luke 23:34) and pain (John 11:35). Prayer - Father, I want to grow in the likeness of Jesus. Please give me the grace to start and complete all spiritual exercise I embark on, so I may embrace a spiritual lifestyle of discipline. Amen.